Coil Solutions offers a variety of Frac Tool rentals that can be used in different configurations for a variety of different size casings, up to a depth of 1500 meters. The Frac Tool Rentals division offers 4 casing sizes of Frac Cups for rental. Well Temperature capability for Frac Cup depends on cup design, durometer and compound of cup. Example: nitrile cup, 80 duro is classed from 50F – 275F for temp and up to approximately 7000psi/49MPA. 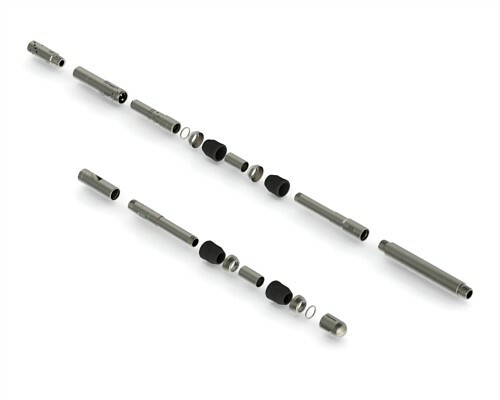 The Frac Tool components for the 4-1/2″ and 5-1/2″ tools are made of 4140 28-32RC L-80. The tools as made up are good to 10,000psi. The pup joints between the top and bottom section of the Frac Tools are usually off the shelve J-55 or whatever the customer requires. Custom Pup Joints can be supplied if required. The 4-1/2″ and 5-1/2″ tools can be made into different configurations by manipulating the pieces for sand, N2 and CO2 Fracs. Pressures between 35-65MPA have been registered across the cups. 48 MPA is the high recommended pressure across the cups. Higher pressure cups may be sourced or developed. The common depth for the 4-1/2″ and 5-1/2″ tool is between 800 and 1500 meters.